Outdoor Courses for Scrambling, Climbing, Kayaking & Mountain Activities: Book your Winter Skills Courses in The Lake District or Scotland. Courses Starting December 1st 2013 and ending April 30th 2014. 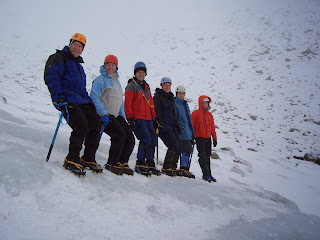 Book your Winter Skills Courses in The Lake District or Scotland. Courses Starting December 1st 2013 and ending April 30th 2014. Winter officially starts this coming Sunday and winter conditions already exist in the Scottish Highlands where a number of winter climbing routes have already seen ascents. Winter is a magical time of year as can be seen from photo one taken in February last year - indeed, this was a very special day in the Cairngorms. As can be seen here - mountains under a Winter mantle of snow & ice are even more beautiful! Winter, of course, brings with it new challenges in the form of a blanket of snow of all consistencies from soft powder through to bone hard neve and ice. Our Winter Skills Training Courses are designed to teach you all that you need to know to be self sufficient and knowledgeable to safely go walking in the UK mountains in Winter. Amongst other skills that you will learn on one of our Winter Skills Training Courses, Ice axe braking is probably one of the most important ones to know. There you are walking above a precipice in thick mist and without warning the surface changes from soft snow to ice and you slip and accelerate into a slide. You still have a hold of your ice axe though; and have been shown what to do. There are a number of ways you may slide - face first like Gary here in photo two, head first on your back, feet first on your back or tumbling uncontrollably. The thing to do is to get on your front with your head facing uphill, get your weight over that ice axe pick to make it dig in and stop that slide. On our Winter Skills Training Courses this is one of the very first things we will show you! Another aspect of Winter Skills Training is Crampon Technique. Crampons should be worn when snow becomes hard and a slip without them becomes more likely - mind you, you'd be amazed how many people seem to wear them in soft snow when in such conditions they are useless! On one of our Winter Skills Training Courses you'll be shown how to correctly fit your crampons to your winter boots and how to tackle icy slopes of all angles during ascent and descent. The team in photo three are using the "Pied a plat" technique for descending hard ice - bending their legs at the knees to keep all of their crampon points in contact with the ice, doing this is most important! As well as Ice Axe and Crampon Techniques, we will also show you techniques for protecting yourself on ground where a slip could turn into something more serious such as a fall. In situations like this, you should consider using a climbing rope - even if it is just to get up or down a short steeper section of snow slope or cornice - but how does one anchor themselves to snow? There are many techniques you can use - the boot/axe belay being demonstrated in photo four by Cherry is a quick & convenient way to lower someone down a slope. Other methods include the Stomper Belay and it's Scottish variant (for use where there is limited snow depth) and the "bucket seat" belay which may be backed up with a Deadman (metal plate), snow or ice bollards or buried ice axes - all used to anchor you to the snow slope. On one of our Winter Skills Training Courses we will teach you all of these techniques. 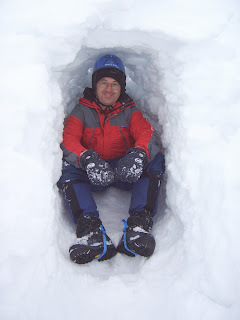 As well as teaching you all of the above techniques, we will also show you how to dig a snow shelter should you become lost or benighted in Winter conditions. There are many variants of snow shelters such as the lean to/sitting bivvi occupied by Steve in Photo five. The best plan is to find a steep bank of snow - dig straight in and then upwards to make for a quick and spacious shelter, but depending on on the depth of snow and your location - this may not always be possible. On our Winter Skills Training Courses we will show you all of the various types of shelter you can build and we will also teach you about Avalanche Prediction. What is an avalanche? it is a layer of snow on top of another layer which for a number of reasons becomes detached and begins to slide downhill burying everything in its path. These are not something you want to be caught in so we will teach you have to examine a suspect snowpack to check for the likelihood of avalanches. A good starting plan is to obtain a copy of the Scottish Avalanche Information Service's local forecast and stay away from any slope aspect indicated grade 3 or above, but there is more to avalanche prediction than that; and we will teach you what you need to know! Conditions for running Winter Skills Training Courses tend to be more reliable in Scotland, however, in recent years, good winter conditions have also returned to The Lake District on occasion - so keep an eye on the forecast and if it is looking promising then give us a call. Courses can be arranged at short notice in either Scotland or the Lake District and start at £75 per person per day for a minimum of two persons. The price per person decreases as the number in your party increases. Helmets and harnesses are provided as part of the fee as are ropes and other technical equipment. You will need to provide your own walking axe, crampons & winter boots but we are happy to advise on what to buy or where to hire. We do advise that people book our two day Winter Skills Training Courses as it takes this long to deliver all of the information that you will need, however, it may also be possible to do this on a one day "modular" basis if you cannot make two consecutive days. To book your Winter Skills Training Course in Scotland or The Lake District Iain can be contacted at short notice on 07761 483364 or you can also contact us via the website if you would like to make a more advance booking or have questions regarding the itinerary of our Winter Skills Training Courses. We look forward to joining you this Winter to teach you those essential skills and to have fun in the snow!